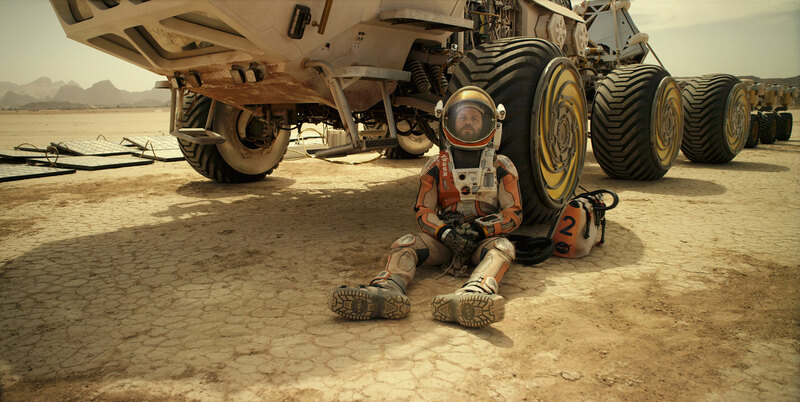 In the book, and now movie, “The Martian,” the protagonist is stranded on Mars with only a slim hope of rescue, assuming that he can science the –er– heck out of his situation. Without giving away too much of the plot, he uses an MAV to blast off from the surface of Mars into LMO. The only problem is that it landed with no return rocket propellant, and, therefore, the rocket fuel and oxidizer tanks are empty! There is a small amount of liquid hydrogen (H​2) rocket fuel on board, but it’s not enough to get back into orbit. So how did our intrepid astronaut S.T.E.M.–user manage to get back into orbit? The answer: by using methane as the rocket fuel. But where did the methane come from? That answer: In-Situ, Brutus? The hydrogen is used along with the Sabatier Reaction to create rocket propellant and needs a lot of carbon dioxide (CO2) to work. Since CO​2;​ is plentiful in the Martian atmosphere, methane (CH​4) and oxygen (O​2​) can be extracted and used as rocket fuel and its oxidizer. We are literally making rocket propellant out of thin air! Methane is also an easier fuel to store for a longer duration than the standard fuel of liquid hydrogen used in most rockets. Now there is no need to bring along said propellant on missions, therefore, allowing for a larger cargo capacity to the Martian surface. Nice! In English, the above translates to two hydrogen molecules plus three carbon dioxide molecules yield one methane molecule, two oxygen molecules, and two carbon monoxide molecules. We now have a propellant generation equation. The MAV uses 15,080 kg of propellant and a propellant mixture ratio of 2.77:1 to hurl itself into Martian orbit. How much hydrogen should the MAV bring? First, we need to determine the proportion of methane and oxygen of the propellant. This now becomes a classic proportion problem where we set up two fractions that are equal to each other, then cross–multiply. Since the rocket only needs 11,080 kg of oxygen, the difference can be used for breathing and other necessities. Generating and storing rocket propellant using ISRU is a nifty way of saving weight for any spacecraft that operates on the Martian surface and needs to blast off back into Martian orbit. In this case, not only do we get to make rocket fuel, but we get to make the very air that we breathe. Kinda takes your breath away, in a manner of speaking! Maybe there’s something to this in–situ stuff after all.